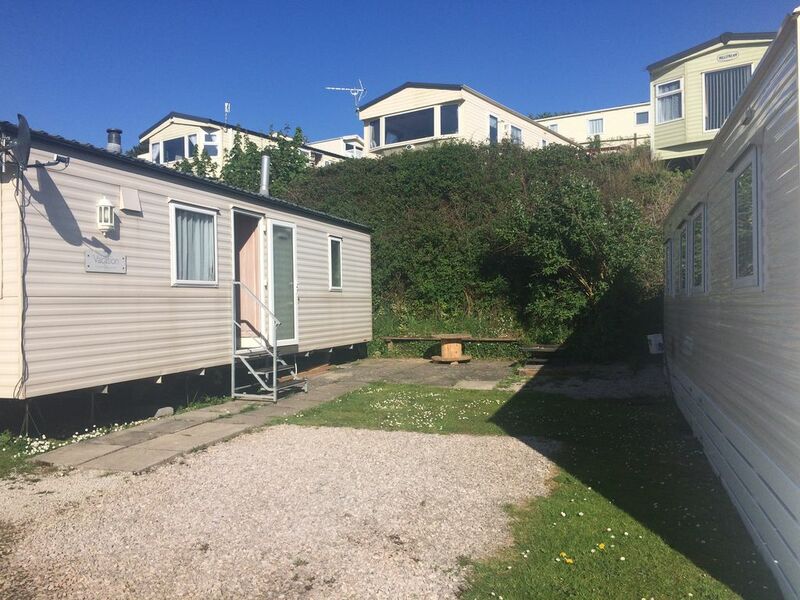 The static caravan is located in a campsite by the sea, with 1 space for 1 vehicle and with sun terrace. The living room is spacious and bright and has a gas fire, digital TV. There is also a dining table with seating for 6. The kitchen is equipped with a gas stove, grill, microwave and fridge / freezer, kettle, toaster. There is a double bedroom, a twin bedroom. All bedrooms have wardrobes or wardrobes. Duvets, sheets and pillows are provided. Towels are not provided. The caravan has a shower room with toilet. Electricity, water and gas is included in the price. quick access to the beach. Lovely caravan, well equipped with everything required. It is a nice caravan in a nice park. The beach where you can walk dogs is about 10 minutes walk away. Great for walks along the coast. Thanks for a great holiday Nick, mobile home was clean and tidy, a lovely cream tea greeted us 😁. A fantastic place for exploring the coastline as long as you don’t mind a few uphill walks, site and beach were lovely. Great caravan with all you need! Had a really lovely stay at this caravan. We arrived earlier than check in time but Nicolas accommodated us and ensured the caravan was cleaned earlier than planned so we could check in. There was a nice gesture of scones, cream and jam left as a welcome. The caravan was clean and comfortable (great double bed) with absolutely everything you could need. Very well equipped. The beach is great, but it helped we had amazing weather!! We used the caravan as more of a base so didn’t really use any of the on site holiday park entertainment but we did go to the indoor pool one morning when it rained and it was clean. We have just arrived back from our stay at At the sea trannnnquille where we had a lovely time. On arrival, Nick the owner had left us a delicious cream tea. This was a great way to start our holiday. The caravan was very clean and comfortable. Everything you need is provided. The caravan is nicely situated at a quiet part of the site. There is a good dog walk. The site has a shop and a bar which also serves food. The area has some beautiful beaches and coves. Excellent coastal walking. Dogs are not allowed on the beach at challanborough bay but just a very short walk on the coastal path to the next beach at Bigbury beach, dogs are allowed or you can go by car. We will definitely stay there again.